ProRes RAW was announced exactly one year ago, but there has been very little progress with it gaining traction in the market. As far as I know, there are still no cameras available that can record it internally. There is very little support for ProRes RAW outside of FCPX. Above you can read our original article on the announcement of ProRes RAW. At the time ProRes RAW was launched it wasn’t being supported by Adobe, Avid or anyone else. If you wanted to take advantage of ProRes RAW then you needed to be a user of FCPX. We were, however, led to believe that other NLE systems would support it in the future. Well, one year on and that still hasn’t happened. We’re always trying to support a wide range of formats, and this particular format I’ve marked as “under consideration” earlier this year as we hear you loud and clear on the desire to have it supported in our products. That said, it isn’t in the release available to you today, and I can’t give you an ETA at this stage. Our priority is to make every new format a great fit in terms of workflow, integration and performance, and sometimes that means it isn’t going to happen at an accelerated pace. Assimilate’s SCRATCH, Grass Valley’s Edius, Colorfront, Filmlight, and a few other post-production systems have announced support for ProRes RAW. While this is positive step in the right direction, most users of cameras that are capable of outputting a RAW signal that can be captured in ProRes RAW and not likely to be using these systems. 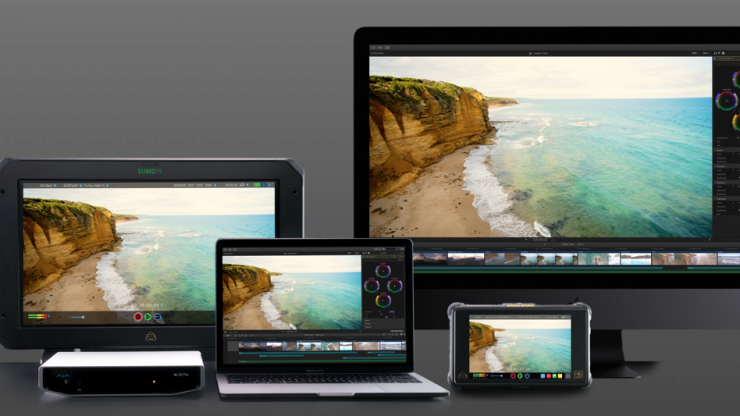 Apple’s ProRes RAW announcement is significant for a number of reasons. The ProRes codec is the most widely used compression format for acquisition, editing, and delivery, worldwide, because it simplifies the camera to delivery process. At the same time, numerous RAW camera formats are available today, which work well for in-depth analyzing of data for their specific product line. Currently all camera manufacturers write their own SDKs for their proprietary RAW formats. There is potential for ProRes RAW to become a ubiquitous camera format, which means camera manufacturers would no longer need to develop the variety of SDKs, resulting in significant cost savings, lowering the barrier to entry, and streamlining the camera workflow. Until ProRes RAW gets support in more mainstream NLE systems such as Premiere and Davinci Resolve most users are still going to have to work within FCPX. It looks unlikely that Blackmagic is going to offer ProRes RAW support in Davinci Resolve after they announced Blackmagic RAW in September last year. Blackmagic RAW is a direct competitor to ProRes RAW. Blackmagic RAW was in development for almost 3 years, so they probably weren’t too phased when Apple announced ProRes RAW. Not only does Blackmagic have their own direct competitor in Blackmacic RAW, but they would would have had to pay royalty fees to Apple to be able to offer it within Davinci Resolve. While Blackmagic RAW is very much an open source codec, ProRes RAW is not. Blackmagic also has the advantage of making their own cameras and products that can utilize Blackmagic RAW. Both the URSA Mini 4.6K, URSA Mini 4.6K G2 and the BMPCC4K can all record Blackmagic RAW internally. So what cameras and devices can use ProRes RAW? Maybe the reason why other cameras can’t record ProRes RAW internally could simply be down to legal reasons. As far as external ProRaw recording goes, that can only be done using the Shogun Inferno and the Sumo 19. Atomos is going to be able to record ProRes RAW from eight currently available cameras, including the 5.7K RAW signal from the Panasonic EVA1. Some of the cameras that can record ProRes RAW externally. The color space and bit depth of the Prores RAW recording is dependent on what the camera is outputting over its SDI. So for example, if your camera is outputting a 12-bit RAW signal, then your ProRes RAW recording will be done in 12-bit. If your camera only outputs RAW in 10-bit, then your recording will be 10-bit. This list of cameras hasn’t changed since the original announcement one year ago. The only new announcement in over a year regarding ProRes RAW is below. In January this year Atomos and Nikon also announced that the Ninja V will be able to record a 12-bit RAW output from the Z6 and Z7. The Nikon Z6 & Z7 will output 4K UHD or Full HD RAW data stream which can be recorded with the Atomos Ninja V to ProRes RAW, capturing the full 12-bit color data. While this was good news, it hasn’t happened yet. The time frame for this actually being released is not going to occur till later this year. Will more mirrorless cameras be able to output a RAW signal over HDMI that can be recorded externally in ProRes RAW? If I was a betting man I would say yes. I think it is very likely that we will see announcements in regards to this happening, if not at NAB, then certainly later this year. 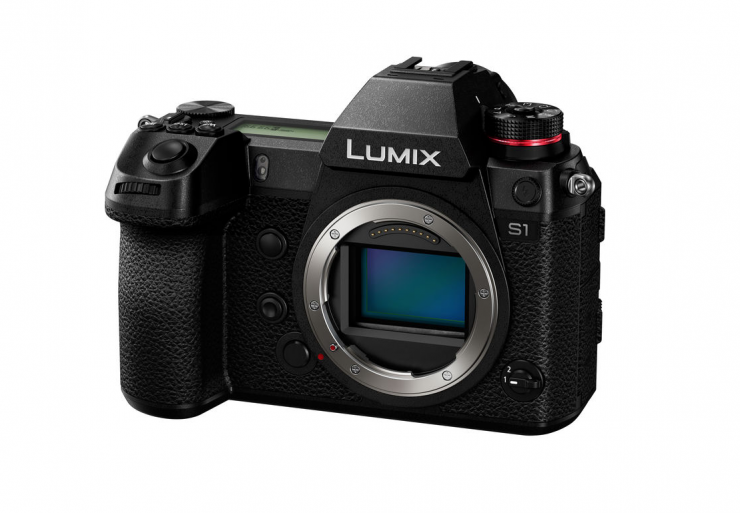 I can only speculate, but I think that the new Panasonic S1 could very well end up being a camera that is able to output a RAW signal over HDMI. 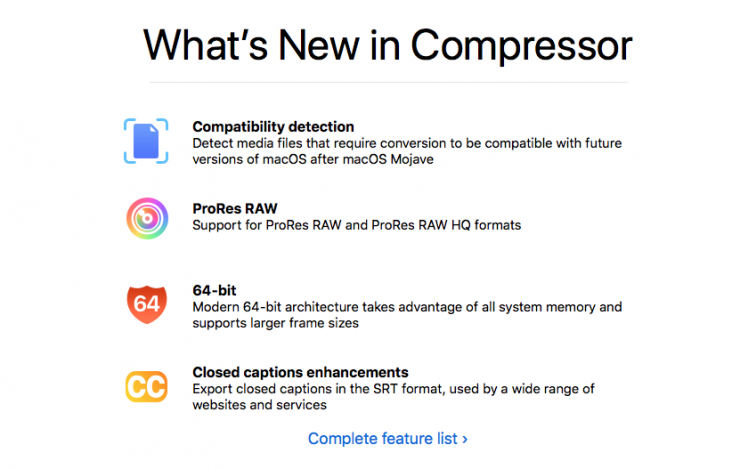 In December last year, Apple released the 4.4.3 update for Compressor that gave it ProRes RAW support with computers that support Metal. 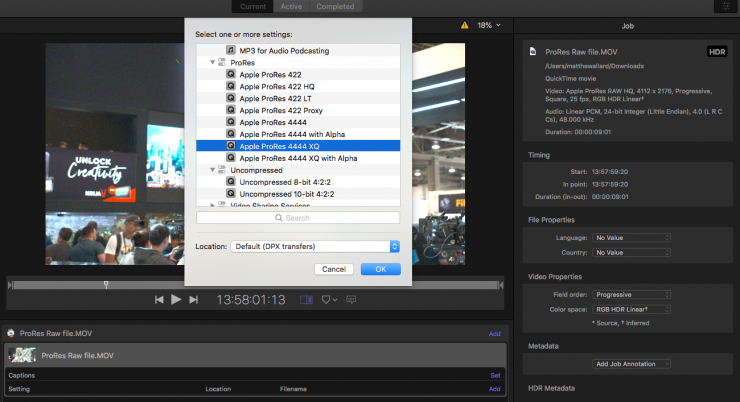 To export ProRes RAW files to other formats, you can only use Final Cut Pro X, Motion, or Compressor. You can’t export ProRes RAW to other formats with QuickTime Player. By giving Compressor the ability to take ProRes RAW files and convert them into another format at least you can edit on another NLE other than FCPX. Yes, this involves another step, but at least it is possible. Is ProRes RAW dead in the water? I don’t think it’s dead, but in some ways, it is still floating in a life preserve waiting to get rescued. I don’t for one second believe that ProRes RAW will drown. Apple tends to play the long game and if you look back at when ProRes was first annnounced, it took quite a long time for it to become an industry stanard. For ProRes RAW to get widely accepted it needs to be implemented into cameras and other NLE systems. I really thought that one year on from its announcement that we would have seen that starting to happen. Hopefully, we will see some more announcements being made at NAB. While it’s certainly nice that you can record externally from some older cameras in ProRes RAW and then edit that material in FCPX, that’s not enough to keep it afloat. Sure, the Atomos and Nikon announcement is intriguing, but until we see cameras that are capable of recording ProRes RAW internally, the whole ecosystem is still fairly niche. ProRes was and in some regards still is almost an industry standard codec. I really thought ProRes RAW had a chance of becoming the defacto RAW standard, but that certainly seems to be a long way off. BlackMagic RAW certainly threw a spanner into the works, but there are so many other companies who also have their own proprietary RAW formats. RED, ARRI, Sony, and Canon all have RAW formats which they have spent time, money and resources to develop. None of these companies are likely to throw away their own RAW formats in favor of ProRes RAW. I don’t honestly think that necessarily has to be the case. I think there is room for all of them to co-exist. So who knows what the future of ProRes RAW is. We will just have to wait and see what happens. Hopefully, we will see more announcements at NAB that relate to ProRes RAW. Have you used ProRes RAW? 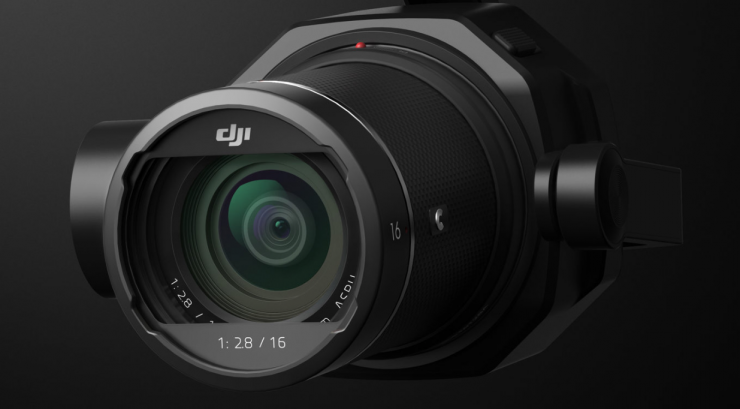 Did you expect other cameras and NLE systems to be using it by now? Let us know in the comments section below.